Revised to recognize new technologies and improve application, the 2019 edition of NFPA 20 helps you provide state-of-the-art fire protection. Added requirements address recent advancement in the field. Other improvements help you avoid errors and misinterpretations. Interested in other editions of NFPA 20? Use the drop down menu above to select the edition year you need. 4.4 Fire Pump Unit Performance. 4.7 Pumps, Drivers, and Controllers. 4.8 Self-Regulating Variable Speed Fire Pump Units. 4.10 Centrifugal Fire Pump Capacities. 4.16 Suction Pipe and Fittings. 4.17 Discharge Pipe and Fittings. 4.19 Protection of Piping Against Damage Due to Movement. 4.20 Relief Valves for Centrifugal Pumps. 4.21 Pumps Arranged in Series. 4.22 Water Flow Test Devices. 4.23 Steam Power Supply Dependability. 4.27 Pressure Maintenance (Jockey or Make-Up) Pumps. 4.28 Summary of Centrifugal Fire Pump Data. 4.29 Backflow Preventers and Check Valves. 4.31 Packaged Fire Pump Assemblies. 4.32 Pressure Actuated Controller Pressure Sensing Lines. 4.34 Field Acceptance Test of Pump Units. 4.35 Automated Inspection, Testing, and Distance Monitoring of Devices, Meters, and Equipment. 5.4 Fire Pump Test Arrangement. 6.2 Factory and Field Performance. 6.5 Connection to Driver and Alignment. 8.2 Foam Concentrate and Additive Pumps. 8.3 Water Mist System Pumps. 8.4 Water Mist Positive Displacement Pumping Units. 8.9 Driver Connection and Alignment. 9.6 On-Site Standby Generator Systems. 9.8 Listed Electrical Circuit Protective System to Controller Wiring. 10.6 Controllers Rated in Excess of 600 V.
10.8 Power Transfer for Alternate Power Supply. 10.9 Controllers for Additive Pump Motors. 10.10 Controllers with Variable Speed Pressure Limiting Control or Variable Speed Suction Limiting Control. 11.4 Fuel Supply and Arrangement. 11.6 Diesel Engine Driver System Operation. 14.1 Hydrostatic Tests and Flushing. 14.3 Record Drawings, Test Reports, Manuals, Special Tools, and Spare Parts. 14.4 Periodic Inspection, Testing, and Maintenance. Apply NFPA 20, Standard for the Installation of Stationary Pumps for Fire Protection to ensure fire pump readiness and reliability. 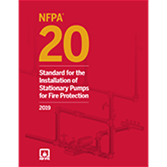 NFPA 20 is the industry's trusted source for comprehensive rules concerning stationary fire pump design, electrical and mechanical construction, acceptance testing, and operation. Installers and maintainers rely on this Standard for guidance on the full range of fire pumps -- including centrifugal, vertical shaft turbine-type, and positive displacement -- limited service controllers, and pumps arranged in series. Each successive edition of NFPA 20 builds on new research and experience in the field. Compliance helps users avoid malfunctions and make sure pumps can deliver on cue. The 2016 edition of NFPA 20, Standard for the Installation of Stationary Pumps for Fire Protection provides first-time requirements for multistage multiport pumps that give designers and engineers more options. This edition also clarifies the requirements for fire pumps arranged in series with new information designers and contractors will need to know to install these types of pump arrangements correctly and ensure they can communicate as intended. The 2013 edition of NFPA 20, Standard for the Installation of Stationary Pumps for Fire Protection responds to industry developments with added coverage of water mist positive displacement pumping units. New provisions addressing diesel engine shutdowns help you avoid equipment damage during testing operations. Other changes include criteria for flow meters to determine accuracy and the need for recalibration. A new rule mandates a flow test within 12 months prior to submission of working plans. The 2010 edition of NFPA 20, Standard for the Installation of Stationary Pumps for Fire Protection includes an all-new Chapter 5 on high-rise buildings, with special provisions based on design practices, risk exposure, and fire fighter operations. Some of the most complex fire pump projects are in high-rises, and this edition of the Standard adds information that is vital to engineers, building owners, and AHJs. The 2007 edition of NFPA 20, Standard for the Installation of Stationary Pumps for Fire Protection broadens coverage with added information on variable speed drive applications, new calculation methods for pressure relief valves and test header piping, and new applications for pressure reducing valves. All-new Tabs for NFPA 20 or the Stationary Fire Pumps and Standpipe Systems Handbook give you the advantage in finding answers and advice.